Pay daycare. Leave check for cleaning service. Buy candle for pumpkin. Remember breastpump. Refill breastpump bags. Pack bottles of milk for morning. Need more bottle labels. Take milk out of freezer when get home so it defrosts in time. Make lunch for tomorrow. Pack and run dishwasher. Three more doses of amoxicillin for Mel. Birthday party on Sunday, must buy present. And wrapping paper. Meeting with mentee Saturday, must pick her up. Dance class for Mel on Saturday. Laundry out of control, must do a wash. Must sew Mel's costume, which is ripped from repeated pre-Halloween wearings. Help decorate for work Halloween party. Speak to someone about broken computer at work. Remember snack for Mel for drive home or else will cry. Pumpkin pie - bake or buy! That list is running through my head all the time. And it doesn't even include the patient-related stuff. Maybe that's part of why I feel like I've been SO forgetful lately. Yesterday was a prime example of my forgetfulness. I arrived at work and was horrified to realize I forgot my breastmilk bags, so I had nothing to pump into. I figured at this point, I should just drive to the daycare to feed her personally. When I arrived at the daycare, I discovered a note saying that I was behind on my payments. (This is not entirely my fault because they don't tell you how much you owe for the month, so I just estimate and sometimes the money runs out before the month ends.) But anyway, I realized I forgot to replace the spare checks in my wallet, so I couldn't pay them. It was an epic fail day. Then I got out of work early and took this amazing opportunity to run to the grocery store. Two things I really needed at the grocery store were cheese and a candle for our pumpkin. After buying a bunch of things and walking out of the store, I discovered I had managed to forget both these things. Sheesh. I'm hoping this is all a matter of having too much to remember and perhaps fatigue rather than really early Alzheimer's. Here is my daughter, Cecelia (oops- Ce-Silly). Eight years old. Dark brown shoulder-length hair, chocolate brown eyes, and olive tan skin. We are standing at a monkey show, one that she reluctantly agreed to attend after a picnic lunch of corn dogs and french fries on the asphalt, to let our stomachs settle before going on more stomach lurching and inner-ear challenging rides. The monkeys and their trainers seem to be high quality - having appeared on Letterman and being stars in all the big movies, but we are still crowded, standing beside over-stuffed primitive bleachers in the hot 90 degrees October summer sun, smelling the strong animal dung from the adjacent barns housing the prize animals from around the state. Her lack of interest took a turn when the beautiful female trainer with the exotic accent asked for a child volunteer from the audience. I laughed internally watching her jump up and down, flailing her hands wildly in the air. So opposite me at her age - I would have been hiding behind the bleachers hoping not to be noticed. Her 6 year old brother with his dirty blond hair, hazel eyes, and devilish good looks was jumping and pointing at her, an exaggerated clown, in attempt to help her realize her ambition. We recently took our first (and maybe only) trip to Walt Disney World, and all her efforts to be a part of every show we watched ended in vain. So I was pleasantly surprised when the trainer turned to her and said, "You, in the pink shirt. You are going to be in our little movie." Cecelia was clearly over the moon. She sauntered front and center and was given a safari hat, asked her name and age which she proudly provided without a hint of embarrassment in front of the 100 plus audience, and told to go back to her family, Jack and I, until she was needed. On the sidelines she spun around in circles smiling, metal braces glinting in the sun, wondering aloud what she would be called upon to do. She didn't have to wonder long. 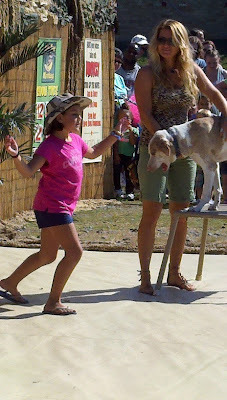 Soon she was back in the limelight, caught up in an elaborate show involving a dog, a monkey, and lots of animal tricks. She took all attempts by the trainers and the animals to surprise her in stride, flummoxing and impressing them at every turn. Happily adoring the large dog that licked her in the face. Following instructions to allow the animals to shine. Bowing not once, but three times with flourish when the show was completed. A mom on the bleachers nearby leaned over to me. "Your daughter is adorable. What a ham. Where does she get it from?" I smiled at the mom and hugged Cecelia, she was returning to us, complimenting her for her bravery when the large baboon with sharp teeth put his arms on her shoulder to smile for a photo op. Her smile was bigger. "Mom, that was the best experience ever. I can't believe I didn't want to do it. I can't wait to tell my teachers and my friends. Can I bring pictures to school Tuesday? Will you get them ready for me?" I put my arms on her and Jack's shoulder and we walked over to the Gravitron. That's what they used to call it anyway, these days it's the Starship 4000, I think. It's the one that spins you so fast you lose gravity, and the kids remembered it fondly from last year. Our stomachs were ready, and we rode it three times before moving on. Thursday night I was lying in bed with Cecelia, her turn for snuggle time. She was discussing a book she recently finished and was re-reading already. The Girl Who Could Fly, by Victoria Forester. I laughed. "Usually I wait a few months at least, for the re-read." She passionately responded, "No, you don't understand, Mom. This book is incredible. It made me happy, and sad, and scared. You can't understand, no way, unless you read it." I smiled, and assured her I could. Thought back to one of those rides, where our bodies were being thrown around mercilessly, and I was staring at the sun to fixate, beaming blissfully, having recently lost the concern that one of my kids might not be enjoying the ride since they are both new found professionals at this. Thinking proudly that life is a ride; books, shows, school, work, and all, and I was preparing them well. I know, it's an old cliche. But watching your kids start to figure it all out makes it seem like a brand new wonderful lesson. It was 3 a.m. on a Saturday night, midway through my intern year, when the impact of pregnancy loss first slapped me in the face. As intern, I was in charge of doing the paperwork for all those being admitted to the hospital that night. The last patient on my list was a pleasant 50 year old women being admitted for pelvic pain. In my rush to finish the paperwork and hopefully get an hour of sleep, I began hammering her with my list of questions. I started with, what every good OB/GYN intern starts with, the "G's and P’s". G=Gravida, which stands for the number of pregnancies. P=Parity, which stands for the number of deliveries. Each piece of the gynecological medical record starts with this bit of information. Yes, OB/GYNs start first by judging the ability of your womb to accept and carry a child. “How many times have you been pregnant?” I ask hurriedly, pencil in hand. “Only once.. but … he didn’t make it.” She said, her voice shaking, with a single tear quickly wiped from her cheek. I was taken aback, both by her response and my own. This loss had occurred years ago, yet still stung so deeply. That night I learned to ask this question more tactfully. A couple years later, I learned another lesson in the pain of pregnancy loss when my own joy of conceiving was quickly mired by seeing blood stained toilet paper. My loss was early, but the pain was deep and real. Time has healed my hurt, but I am frequently reminded of the pain of loss as I am often the bearer of bad news. Sadly, miscarriage is extremely common and something I had dealt with on a regular basis, but I had not truly appreciated the level of loss experienced, until I was on the other side of the stethoscope. Over the years I learned to look differently at the G’s and P’s on the medical record. My heart will ache when I see a G6P2, realizing the painful reality that the 4 losses must represent. I cannot fathom feeling your heart sink so deep with disappointment, not just once, but 4 times. October 15 is pregnancy and infant loss day. A time to remember and acknowledge the loss and pain that occurs when the G’s and P’s do not align. For those of you who have have experienced this loss, I cannot say I know how you feel, for everyone processes loss differently. I can say that I acknowledge that your pain is real and I pray that in your journey, you find peace and healing. I recently finished "I Don't Know How She Does It" by Allison Pearson, about an investment banker trying to juggle motherhood with a busy career. I spent most of the book thinking to myself, "YES! YES! That's EXACTLY how it is!" It actually made me feel better about myself as a working mother because at least I'm not jetting to Milan every weekend. One of my YES moments when reading the book was when the protagonist was late for work because her nanny didn't show up on time, but she felt like she should use "a man's excuse" instead. Men aren't late because of sick kids or tardy nannies--men are late because of traffic or car trouble. And male bosses respect a man's excuse more than a woman's excuse. Lately I've been forced to use the "sick kid" excuse a lot and I always hate it. I haven't used it as an excuse to not do work or not show up, but to explain why I'm being extremely efficient, skipping lunch, avoiding small talk, and postponing a few things till the next day. It's embarrassing for me and makes me feel unreliable. Especially when sick kid isn't miraculously better in one day and eventually requires a doctor's visit, then second kid gets sick right after. That's nearly two weeks of having to mumble excuses about sick kids. It makes me feel like I'm seen as unreliable. It makes me feel like I'm being labeled as "that woman who's always leaving early because her kids are sick." It certainly doesn't make me feel like I'm going to get a raise or promotion any time soon. Of all my family members, the one I'm probably most like is my grandmother on my father's side. Unfortunately, I wasn't that close to her and only realized this years after she died. My grandmother was a teacher and she loved to write. After her death, my father came across a bunch of clippings from articles she had written for her condo newsletter. If she had been around now, she totally would have been a blogger, I can tell. Her articles were all the sort of "reflections" that make up the typical blog entry. My father told me he thought it would be a nice tribute to her to bind the articles in some way and distribute this to her relatives. I told him to let me take care of it. Over the summer, I scanned in her articles, formatted them, and published a 100-page book on Lulu that looks exactly like a real book. Then we distributed copies of her book to all her grandchildren and other relatives. It brought me great pleasure to do this. I know it's what she would have wanted because it's what I would have wanted. When I blog, I have this fantasy in the back of my mind that my children or even my grandchildren will someday be reading my totally brilliant insights. I was doing it for her, but in a way, I was also doing it for me. If that makes sense. I think it's kind of amazing that companies like Lulu allow people like me and my grandmother to sort of live out our fantasies. Today I had one of those unexpectedly gut-wrenching experiences, as I was waiting for the elevator on one of the medical floors, the one that looks out onto the Helipad. I’m always amazed that the pilot can land a helicopter full of bustling paramedics and a (usually) severely injured patient on this relatively tiny piece of rooftop. I had finished rounding on our inpatients, and I wasn’t in a hurry to get anywhere, so I walked to the window, and watched. It was a beautiful clear day, and the large window is fairly close to the landing pad. The helicopter had just landed and the crew was pulling out the stretcher. There was a carseat on it, with a very awake and scared toddler strapped in, clutching a teddy bear. He wasn’t crying; he was craning his head this way and that, looking around, probably for his mom or dad, but it was only uniformed crew members around him. I could even see that his teddy was kind of worn, and lopsided, like it’d been washed. As the crews started wheeling the stretcher towards the doors, the teddy started to fall, and the toddler frantically grasped at it; there was a flash of panic in his already terrified eyes. But a crew member stopped the stretcher and planted the teddy firmly in the boy’s arms, before continuing, and the boy clutched at that teddy for dear life. In the space of those few seconds, I not only wondered, I wanted to know how hurt the toddler was, or if he’d been airlifted as a precaution, or where his parents were? What happened, how bad was the accident? Were his parents OK? And I thought of my toddler at home, just starting to get attached to his own Teddy; just starting to realize when we leave and when we come home. Lately he cries around strangers and clings to us… I imagined him in a carseat strapped to a stretcher and airlifted to a rooftop trauma center somewhere. Would a crew member be so kind as to make sure his Teddy didn’t fall out of his arms? And I pretty much almost lost it right there. My eyes blurred with tears, and I would have started bawling, but the “ding” of the elevator arriving made me pull it together. The elevator doors opened but I still watched as the crew wheeled the baby in the carseat out of sight, my eyes welling with tears. All day the image of the baby in the carseat, the flash of panic, the grasping for teddy, the crew member placing the teddy in his arms… all day this has been with me and all day I have been just on the verge of tears. And at the end of the day, as I was walking to my car, again thinking of this, and reflecting on how lucky we are, and how anything can happen to us at any time, I saw elephants. I mean, real elephants. Apparently, the circus is in town, and they were unloading the elephants from the trucks to the stadium. The stadium is right near my parking lot, and I got quite a show: Three elephants marching up the long ramp to the delivery bay, each one holding the tail of the one in front of it with their trunks, so adorable. They weren’t very large elephants, must have been Indian elephants, if I’ve learned anything from Animal planet. There were many people who had stopped to watch this spectacle, including some moms with babies in strollers. And I again thought of my toddler at home. He would have got such a kick out of this. He loves animals. I teared up again, but this time a smiling-tearing-up. Someday, I thought, we’ll take him to the circus. That we can do. I’ve been away for a while now, birthing, or perhaps mid-wifing, two books. For me, editing seeps into writing and rewriting for others, to the point where I am not sure whether I wish I’d said that, or I did say that. What on earth was I thinking, involving myself in two projects with competing deadlines, and then volunteering to write an index? Here is what I didn’t have time to write in May: At graduation, I again heard the speech about putting patients first, sacrificing ourselves to medicine. I could see all the graduating students, especially the women, looking vaguely shifty-eyed, wondering what those exhortations would mean to them and their hopes for a full and balanced life. I think beyond valuing the contribution of privileged males, medicine suffers from its institutional history. The structures of medicine and medical education are eerily like those of the Catholic Church and the military—institutions in which celibate young men with great physical stamina have the greatest value in perpetuating the institution. I do believe in the value of altruism, selflessness, and commitment—but I also believe these can be expressed in many contexts. When I am in the office, I will do for my patients whatever I can, above and beyond what they pay me to do. When I am on call, I stay late. But I do not think that I am any less of a dedicated professional (a word originally applied to priests) because I also worked part time for many years while my children were younger, pursue hobbies now that they are grown, and comfortably wear many different hats and uniforms, depending on the day. I wish that just once the graduation speaker would say this out loud—it is, after all, what all of us, men and women, really do and mean in our lives after training. This was an exciting place to live. I remember driving here in the moving van, young and idealistic, freshly married. I bought my first house here, had our first (and only) child. I learned my craft here, entered the fires of neurosurgical residency. After six years, the crucible decanted me into a busy, thriving private practice in my original hometown. Now, I am part of the storied history of my training program, one of only four women to graduate, one of many well trained neurosurgeons this city has disseminated across the front lines of America's hospitals. I am proud of my training program and its history, its traditions. I am humbled by and deeply grateful to my mentors here. So, when the news came that my program chairman was retiring this weekend, I immediately rearranged my schedule so that I could be here for the celebration. This man is one of the great names in neurosurgery. He is technically a master of complex skull base surgery. He has held the most august academic positions, has received international honors. He is, quite simply, one of the most brilliant men I have ever known. And yet, as he said in his speech last night, he feels that his greatest accomplishment is us, his residents. We all have a dream that we spend a life to pursue. We work, we suffer, we make sacrifices - and we keep dreaming. He said last night, "It's never been about me. It's been all about the residents, the education. Anybody who does this knows that teaching residents is like raising kids. The people I chose to go through this program are a reflection of me; their success or failure is my responsibility. It's been about teaching the next generation, making sure this program lives up to its tradition of greatness." We were his dream, us and his own five kids and twelve grandkids. At dinner, many of us had a toast to make, a story to tell. Mine was about a favorite memory from residency. We had journal club once a week, at 6:00 or 6:30 am, over breakfast. One morning, the topic was sports injuries. We reviewed several articles comparing different sports and the risk of serious neurologic injury in each. Ice hockey, soccer, baseball, basketball were all on the charts, but football was way up high at the top of the list. There was a huge gap between it and the next sport down. We spent 45 minutes seriously discussing the ramifications of this. Then the room got quiet, and my chairman piped up, not having said anything up to this point. He stated cheerfully, "I like to play football." We stared. "Because I like to hit people!" he finished. We must have laughed for five minutes! At the end of telling this story, I mentioned that now I have a 13 year old son who plays football. Every time he takes the field, I think of my chairman and chuckle a little. I finished by stating, "Thank you for being the best possible example. You showed us all that you can be a neurosurgeon and be brilliant... but also be a real person, and a great guy." We will remember our chairman, who could give the presidential address at the big national meeting and then greet us on a Saturday at the local IHOP, driving up for breakfast in his beat up gray pickup truck. We will remember how he always asked about our families, and how proud he was of the number of babies the residents had. Cheers, doc, mentor, friend. You deserve all the honor and respect you have gained from us all. Your dream allowed us to realize ours. We will pass it on, and on. My dream will help my son realize his one day, whatever his turns out to be. We all have a dream, probably more than one. That guy playing blues on his saxophone outside my window right now has one. Mine has been to succeed in the most difficult, and most rewarding, career that I could have imagined; to also succeed in constructing a happy, healthy family. We work, we suffer, we make sacrifices. We hold onto the dream. It may come true, or it may not. But in the end, we will know that we have given it our best. 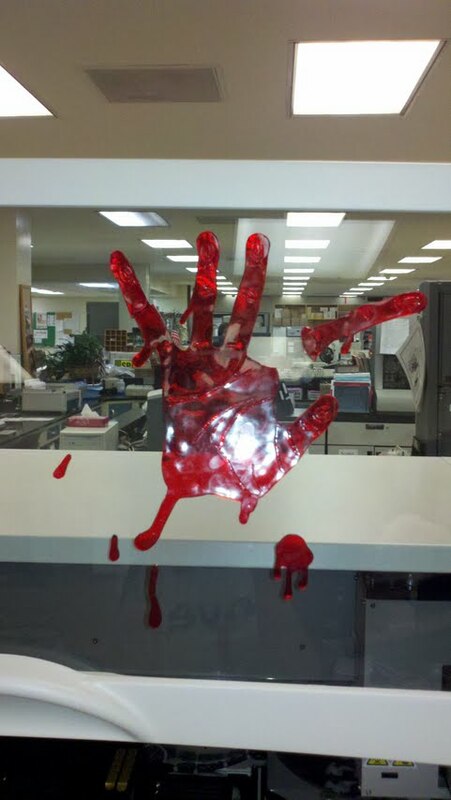 The Blood Bank always has some pretty interesting Halloween decorations. Last year they had gel blood dripping from the top of the main door. 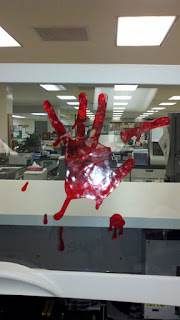 This year I was excited to see a bloody hand at the Blood Bank blood product distribution window. The window is kind of like a fast food restaurant window - only it opens bottom to top instead of sliding sideways. I imagine it was designed in the 1960's. This morning when I went to take a photo of it for this blog that was marinating in my head, I was upset to find it missing. I wandered into the blood bank. "Where is that bloody hand decoration that was in the window?" "Someone complained. We put it on the patient specimen refrigerator." "What? It is fabulous! Who complained?" "I know. We were upset too. We think that the patients over in fast track ED waiting area, the ones who use the lab bathroom, got upset when walking by it." "Well, maybe an ED patient might find a bloody hand distasteful. Oh well." I started to take a picture of the one on the patient specimen fridge. It looked great - the door is glass and you could see all of the bags of blood behind the bloody hand. I worried aloud. "If I take the picture here, well, there are patient names. Someone might see them, if I show the picture." The tech answered, "I wouldn't worry, they are so small, how would you see them? There is another one on the ProVue, but one of the fingers is detached." Since this was for the blog, and I think maybe anyone could blow up the patient specimen fridge pic and manage to find a patient name with the technology available these days, I decided it wasn't appropriate. Big possible HIPAA violation. So I wandered over to the ProVue, and took this pic. I love how festive everyone in the lab gets on the holidays. So now I have to tell a Blood Bank story. As pathologists, we supervise the Blood Bank. One of my partners has a Blood Bank fellowship from Johns Hopkins, so he is the main supervisor, but when we rotate as clinical pathologists on call, we take the calls from every section in the lab. Most calls from the Blood Bank are routine, for example, "We've got a 56 year old man in surgery. We are out of 0 neg. Can we switch him to 0 pos?" "Yes, of course." Sometimes, though, you've got to play God, which is kind of scary. There are a lot of shortages of blood products, and when multiple clinicians are fighting over products for their patients, ones that we don't have enough of at the moment, we have to decide who needs them the most, and triage appropriately. The last time I was on call, I got a call from a heme/onc doc. She is lovely and intelligent and gregarious, and passionate about patient care. We were fellows together at the VA, and she often called me to do fine needle aspirations to diagnose follow up lymphoma patients. So we have been a team for a long time, and are on cell phone basis, which is a step above pager basis in the clinician world. I was at The Pizza Joint on a Friday night around 7:30 with my kids when the phone rang. I immediately recognized the number. "I'm so sorry to bother you at dinner, but I've got a big problem. My nurse has been talking to the Blood Bank and they say they are out of platelets - won't have any until 8 a.m. I've got a patient that desperately needs them. Can we call Red Cross? Have some flown in from somewhere? He just got out of surgery and he's bleeding out." When she said the patient name I immediately knew the history. I had been dealing with him all day with a surgeon, and knew he was pretty critical. "Let me just call the Blood Bank and I will see what I can do. I'll call you back." I plugged my kids in with my parents and their pizza-slinging, college student, summer sitter extraordinaire, and stepped outside where it was quieter to deal with the problem. Called the Blood Bank, and talked to the head tech. "Yes, we are out of platelets until tomorrow. But we've got two set up for a patient in the CVICU. And we've got some baby platelets." "What is the platelet count on the patient in CVICU? Are they actively bleeding?" "Well, get those platelets for our post-op bleeding patient. And save the baby ones, too, in case we need them." I knew, especially since my dad is a neonatologist, that most baby platelets are set up on a protocol and given at a certain platelet number in a baby as routine - they could most definitely wait until the next morning at 8 a.m., not being critical, in the vast majority of cases. I called my heme/onc friend back, and told her what I had managed - that we garnered two units from the guy in CVICU and had some babies if we needed them. She sighed with relief and thanked me. I went back in to The Pizza Joint to finish dinner and pay the bill. The next morning I was triaging bone marrows and lymph nodes - it was a busy Saturday call. I never get follow-up - but checked on the patient I had emergently triaged platelets to in the EMR (electronic medical record) and was happy to see he was still alive. I also checked on the guy I had stole the platelets from - I would be lying if I didn't tell you I had a tiny anxiety attack in the middle of the night that he actually needed them more than my bleeding guy and my decision had hurt him - but he was stable as well, and now we had more platelets, and everyone who needed them was getting them. My turn to breathe a sigh of relief. There is a moral here. Give blood products! And please don't be offended by our lab Halloween decorations - we are a very congenial, if a little nerdy, lot. We mean well. This weekend, I had an unpleasant encounter in the parking lot when I was at the grocery store. I shop at this HUGE strip mall, and there are probably at least a hundred spots right in front of the grocery store. I try to park a bit off the the side so that there won't be lots of people around. Anyway, I parked off to the side, and there was an empty spot next to me, so I had the back door wide open while I tried to get the baby out of her carseat. So I'm getting her straps open and I hear this honk: a woman was trying to pull into the spot right next to me and she couldn't because I had the door to my car open. Now the lot was nowhere near full. There were empty spots behind me. There were empty spots across from me. There was absolutely no reason why anyone had to have the spot directly next to mine while I was struggling to get my baby out of the car. I kind of waved my hand helplessly and closed the door a little bit more. She went into the spot and pulled through to the spot in the next row (which she also could have gotten to by just spending two seconds driving around the row). And then the woman, who had her window down, yells at me, "That's not very nice, you know." I yelled back something like, "You have the whole huge lot to park in!" It was sort of ironic that she said that to me, because I spend my life obsessing over whether I'm nice or not. I want desperately to be nice. I hold doors for people, I always brake to allow people make the difficult left turn out of the McDonald's by my house, I try to give money to charity, and I usually tip more than 20%. At work, I make a huge effort to be perceived as "nice" by staff and patients. I try to smile a lot at people, even when I'm exhausted and not entirely feeling it. I write "please" and "thank you" in my orders. Whenever a nurse or therapist alerts me about something, I make a big deal out of thanking them. I want people to say, "That Dr. Fizzy is so nice!" Of course, I worry that the fact that I am always conscious of making an effort means that I'm not genuinely nice. Maybe I'm just faking nice. Making I'm actually a jerk and nobody is fooled by my nice facade. Or maybe I shouldn't let myself get so riled up by a crazy woman in the parking lot. Sometimes, I am jealous of my husband's relationship with our daughter. They play games I don't follow, tell inside jokes, and make up words. Neither cares if the beds are unmade, there is applesauce on her shirt, or if daddy hasn't shaved in weeks. They have the same goofy sense of humor. I have been described as many things in my life, both positive and negative, but "goofy" has never been one of them. But lately their relationship has been strained by our daughter's insatiable interest in all things "girlie" - princesses, fairies, pink ruffles, dresses, dance shoes, jewelry, etc. My husband threw an adult tantrum when she refused to go to the park with him because she would have to take off her "dance shoes" ballet flats with rhinestones pasted on- a big no-thank-you to my mom....), which are not to be worn outside. We created that rule thinking it would limit her wear of the shoes, never anticipating she would instead opt out of playtime with dad. He threatened to throw out the dance shoes and all her dresses if she did not take them off immediately and come outside. Predictably, she burst into tears. Even though I know he is just upset that he could be losing his best little buddy, I got annoyed at what I judged to be a total over-reaction. For some very muddled reasons- that I will attempt to clarify here- I think I would be more comfortable if she were to dress up as The Supreme Fairy Queen from the Land of Helpless Dimwits and Antiquated Ideals of Feminine Virtue than wear this outfit out on October 31. The fact that my husband will be out of town, leaving me alone to parade my daughter around the neighborhood dressed up as a mini-me, certainly isn't alleviating my discomfort. And to be fair, I think I should mention that last year we dressed her up as an astronaut and the year before she was a zookeeper. At age 2 1/2, she takes swim lessons and Spanish classes. Next year we hope to start her in Mandarin and ballet. We have chosen to pay more for what we believe to be a better preschool. In short, we are exactly the sort of middle class people with high parental expectations to which this sort of merchandise is marketed. So why does this costume make me feel so, well, squeamish? I guess some of my unease is easily explainable. I know way too many physicians who dislike our profession, a profession that was chosen for them by their parents. I vowed long before I became pregnant that I would never pressure my child to enter medicine. If he or she wanted to go to medical school, they would do so with a more complete understanding of the life of a physician than I had when I made the same decision. But there is just something about medicine that makes parents think "it will be good for her", just like Mandarin class I suppose, and results in some obedient little children being pushed into a career that is just too demanding when pursued on a parent's behalf. It is perhaps internally inconsistent that I am completely content to be the mom with the vocabulary flashcards but am emotionally tortured by even appearing to pressure my daughter into medicine. I may not be a perfect parent (and truthfully, some days I am just shooting for "acceptable") but I hope to encourage my daughter to contribute to society in a manner of her choosing that that fulfills her emotionally and intellectually. If that isn't in medicine, than at least she won’t incur as much educational debt as I did. And we might have found a solution to my mini-me misgivings. She is very excited about the doctor's costume, but wants to be a "dancing doctor". Since my husband will be out of town, I might just let her pair her coat and scrubs with those rhinestone encrusted shoes. And some fairy wings.